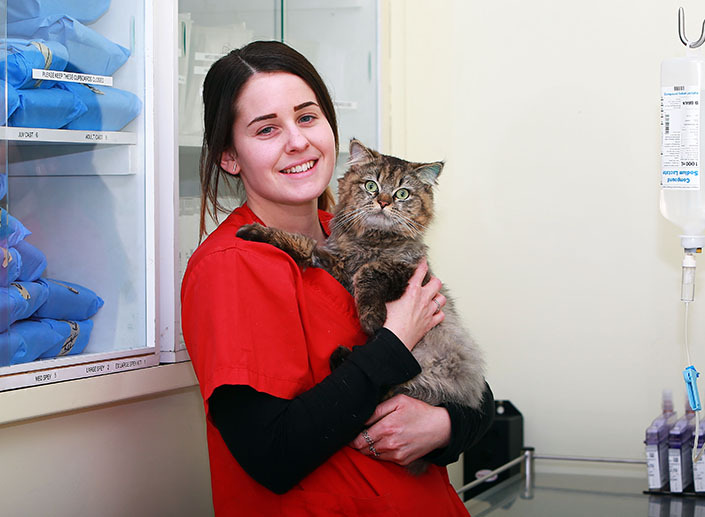 Today is Vet Nurse Day – a day to celebrate and thank the people who dedicate their lives to caring for sick and injured animals. They’re knowledgeable, compassionate, and not afraid to get their hands dirty! At the Home’s shelter hospital, our vet nurses never know what is about to come through their doors. Every day, lost and abandoned pets arrive at the hospital with a broad range of illness and injury, but no medical history to rely on. 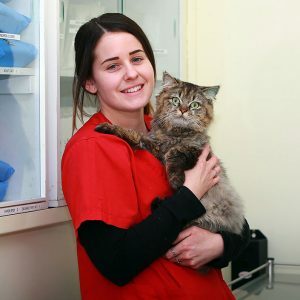 Our vet nurses undertake a number of tasks, including; monitoring patients under anaesthetic, medicating sick animals, assisting vets with patient care, providing emergency care, calculating and dispensing medications, taking radiographs, and working out in the community helping to desex cats in our mobile pet care unit, MADI. Of course, the list goes on! To mark Vet Nurse Day, we’re introducing you to some of the many compassionate and highly-skilled vet nurses who look after sick and injured pets at the Home’s shelter hospital. “I’ve been working at the Home for almost four years. I volunteered once a week in the hospital for six months prior to that. The first year I worked as an adoption nurse, then as a vet nurse since then. I’ve always loved animals and wanted to do a job where I could help others. It took me a while to figure out how I was going to do that, though. I was working in hospitality when I became interested in animal welfare. I used to spend hours watching animal rescue shows on television and researched ways I could get involved. I realised that being a vet nurse in a shelter was my dream job! I volunteered on my day off each week while I was managing a pub until I was able to start studying and make the career jump. I love getting to meet all the beautiful dogs and cats we get to work with every day. They make me smile and inspire me, and I fall in love on a daily basis! Most of them are unwanted and some are mistreated, but they are so brave. Being able to help them even in a small way is very rewarding. “I’ve worked as a nurse at the Home for almost four years. The year before that, I was studying vet nursing and working here for my school placement one day a week. Before that, I was a dog walking volunteer. As I got older I knew that I needed to ‘give back’ with my job to be satisfied. I love animals, feel a connection with them and knew that working in animal welfare was something I needed to do. After volunteering here as a dog walker and leaving at the end of each shift, I felt the need to do more for the animals and be here more often. I worked in pharmacy previously and am interested in the medical side of things, so vet nursing seemed like the perfect fit for me! There are two things I love about working as a vet nurse at the Home. 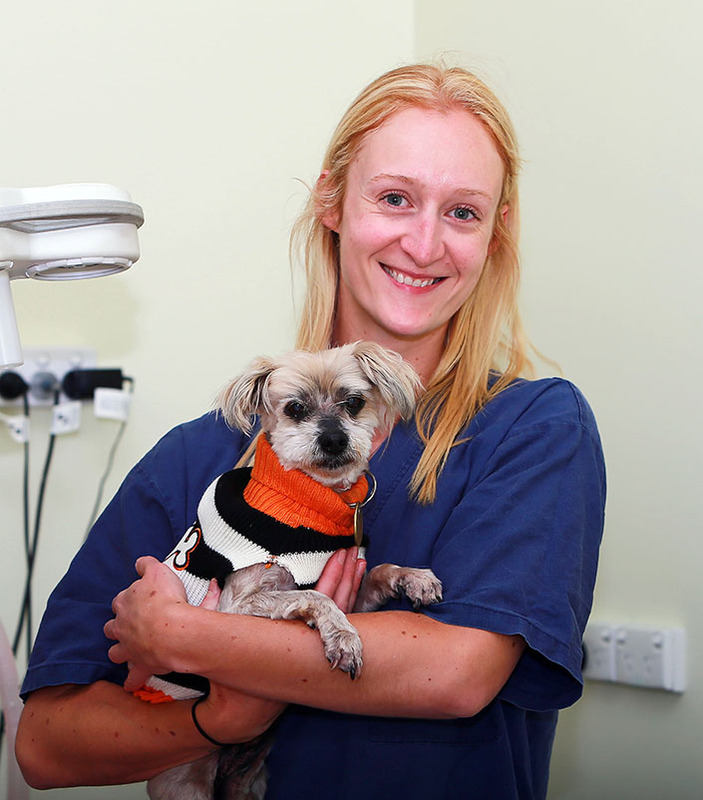 One is the amazing veterinary team we have here. I’m lucky enough to work with not only colleagues, but friends who I admire on a daily basis. I also love the ability to make a difference in an animal’s life. To teach them about love and care again when sometimes they have unfortunately been missing that. “I’ve been working at the Home since March 2014. I never indented to be a vet nurse, I just kind of fell into the job. My background is in zoology and conservation, so I’ve always loved animals and nature. In 2013 I worked in Africa for eight months doing wildlife research, and upon my return home I was looking to get actively involved in animal welfare. Nursing at the home satisfies my love for learning, science and animals. Caring for unwanted, injured and abused animals is easily the most rewarding part of my job, but I also love the people I work with every day. The shelter medicine team is full of compassionate, skilled and dedicated people and we complete an enormous amount of work every day. Working in such a supportive team allows me to ask questions and try new things to broaden my nursing skills and knowledge. Seeing our patients recover from surgery, neglect or abuse and find their forever homes is indescribable. 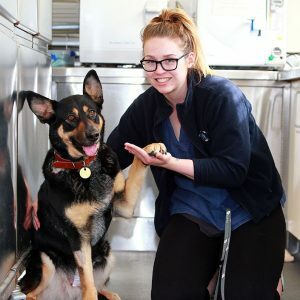 Working in the shelter means I get to care for the most vulnerable animals in our community and I feel privileged to be able to provide them with the love and care they deserve. We extend a heartfelt thanks to all of our vet nurses. Their dedication and passion for animals helps improve and save the lives of thousands of homeless pets each and every year. If you’d like to support the life-saving work of our shelter medicine team, please donate today.